My Top 10 Super Foods - Welcome to SarahKesseli.com! Have you ever wondered what a “Super Food” is exactly? 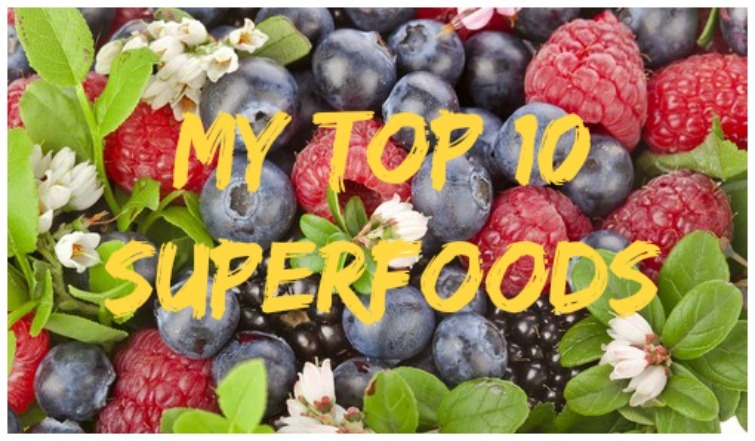 A Super Food is defined as, “A nutrient-rich food that is considered to be especially beneficial for both health and wellbeing.” Today we are going to take a look at my top 10 favorite super foods and why they are so good for you! Cranberries – this fruit helps to fight inflammation in the body, reduce risk of heart disease and prevent yeast infections. Avocado – is loaded with healthy mono saturated fats which improve cholesterol levels and decrease the risk of heart disease. Chia – this seed is loaded with fiber! It is also packed with magnesium, antioxidants and proven to lower cardiovascular disease. Broccoli – this green veggie is packed with vitamins, minerals and fiber! It also has high levels of folate (important for women) and helps fight off disease. Almonds – this nuts has a good dose of fiber, plus it is packed with magnesium, potassium, iron and calcium. Flax – is another seed that is fiber packed and full of heart healthy omega 3 fatty acids. It helps protect against heart disease and cancer. Cacao – chocolate as a ‘super food’? Yes! This delight is full of disease fighting antioxidants that help in the prevention of cardiovascular disease. Blueberries – these little berries are packed with fiber, vitamin C and antioxidants. They aid in protecting against heart disease and cancer. Greek Yogurt – This tart treating is packed with probiotics that aid in digestion and boost the immune system. It is also gives you a big protein punch! Incorporating a few of these Super Foods into your day can make for a delicious and nutrient packed day! Share with us, what are YOUR favorite Super Foods?